The green sand is the natural sand containing sufficient moisture in it. It is mixture of silica and 15 to 30% clay with about 8% water. Clay and water act as a bonding material to give strength. Molds made from this sand are known as green sand mould. The green sand is used only for simple and rough casting products. It is used for both ferrous and non-ferrous metals. When the moisture is removed from green sand, it is known as dry sand. The mould produced by dry sand has greater strength, rigidity and thermal stability. 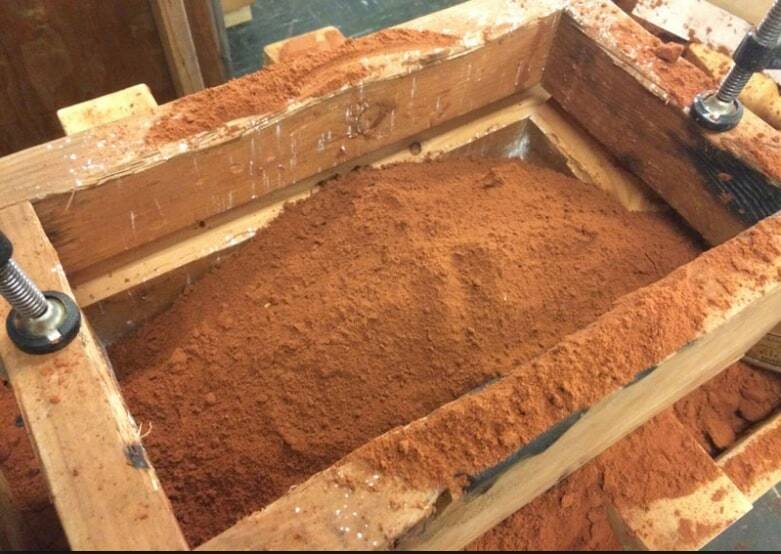 This sand is used for large and heavy castings. Loam sand is a mixture of 50 percent sand and 50 percent clay. Water is added in sufficient amount. It is used for large and heavy moulds e.g., turbine parts, hoppers etc. A sand used for facing of the mould is known as facing sand. It consists of silica sand and clay, without addition of used sand. It is used directly next to the surface of the pattern. Facing sand comes in direct contact with the hot molten metal; therefore it must have high refractoriness and strength. It has very fine grains. A pure silica sand employed on the faces of the pattern before moulding is known as parting sand. When the pattern is withdrawn from the mould, the moulding sand sticks to it. To avoid sticking, parting sand is sprinkled on the pattern before it is embedded in the moulding sand. Parting sand is also sprinkled on the contact surface of cope, drag and cheek. The backing sand is old and repeatedly used sand of black colour. It is used to back up the facing sand and to fill the whole volume of the box. This sand is accumulated on the floor after casting and hence also known as floor sand. The sand employed in mechanical heavy castings and has high strength, permeability and refractoriness, is known as system sand. It is used for machine moulding to fill the whole flask. In machine moulding no facing sand is used. The system sand is cleaned and has special additives. A sand used for making cores is known as core sand. It is silica sand mixed with core oil (linseed oil, resin, mineral oil) and other binding materials (dextrine, corn flour, sodium silicate). It has remarkable compressive strength. A sand which carries molasses as a binder is known as molasses sand. It is used for core making and small castings of intricate shapes. Porosity also known as permeability is the most important property of the moulding sand. It is the ability of the moulding sand to allow gasses to pass through. Gasses and steam are generated during the pouring of molten metal into the sand cavity. This property depends not only on the shape and size of the particles of the sand but also on the amount of the clay, binding material, and moisture contents in the mixture. Cohesiveness is the property of sand to hold its particles together. It may be defined as the strength of the moulding sand. This property plays a vital role in retaining intricate shapes of the mould. Insufficient strength may lead to a collapse in the mould particles during handling, turning over, or closing. Clay and bentonite improves the cohesiveness. Adhesiveness is the property of sand due to which the sand particles sticks to the sides of the moulding box. Adhesiveness of sand enables the proper lifting of cope along with the sand. Plasticity is the property of the moulding sand by virtue of which it flows to all corners around the mould when rammed, thus not providing any possibility of left out spaces, andacquires a predetermined shape under ramming pressure. Flow-ability is the ability of moulding sand to free flow and fill the recesses and the fine details in the pattern. It varies with moisture content. Collapsibility is the property of sand due to which the sand mould collapse automatically after the solidification of the casting. The mould should disintegrate into small particles of moulding sand with minimum force after the casting is removed from it. Refractoriness is the property of sand to withstand high temperature of molten metal without fusion or soften. Moulding sands with poor refractoriness may burn when the molten metal is poured into the mould. Usually, sand moulds should be able to withstand up to 1650°C.